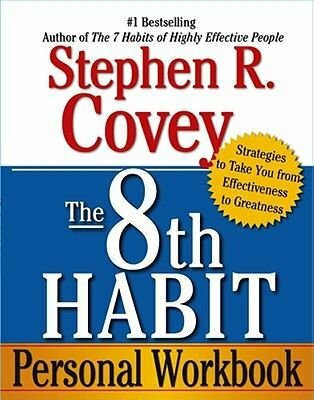 From Stephen R. Covey, bestselling author of "The 8th Habit: From Effectiveness to Greatness, " comes the accompanying personal workbook that will help you further realize the power of this new habit. The world has changed dramatically since Covey's classic "The 7 Habits of Highly Effective People" was published. The challenges we all face in our relationships, families, professional lives and communities are of an entirely new order of magnitude. In order to thrive in what Covey calls the new Knowledge Worker Age, we need to build on and move beyond effectiveness -- to greatness. Accessing the higher reaches of human genius and motivation in today's reality requires a whole new habit. The questionnaires, tests, self-assessments, and other exercises in this workbook provide a hands-on approach to developing the mind-set, skill-set and tool-set for achieving greatness in the Knowledge Worker Age. The 8th Habit will transform the way you think about yourself and your purpose in life, about your organization and about humankind.